Let us pray: Lord, open our hearts to your word, which comforts and instructs. Show us something new about you, or remind us of what we’ve forgotten. And may the words of my mouth and the meditations of all our hearts be pleasing in your sight, O Lord, our rock and our redeemer. Amen. I have had this lamb just about since I was born. I have absolutely no memory of this, to be fair. For as long as I can actually remember, it’s been sitting on a shelf, next to a bunch of other things from my childhood. I’ve forgotten why many of them are special, but haven’t quite thought about getting rid of them yet. But I remembered that I had this lamb as I was preparing for this Sunday, which is full of shepherds and lambs, and I pulled it out to see if I wanted to use it for the children’s moment. Once I pulled it out, I could see that it had clearly been well-loved: its fur is definitely not white anymore, and it’s missing entire patches of fur. And yet I didn’t remember even touching this lamb except to dust around it. So I texted my mom. She, like me, had no idea where the lamb came from: Maybe I’d gotten it when I was born? Maybe for my first Christmas? But then she told me more: that when I was still in my crib, I liked to go to sleep with it. My parents would start the music–because it’s also a music box–and leave me to sleep with my musical sheep. 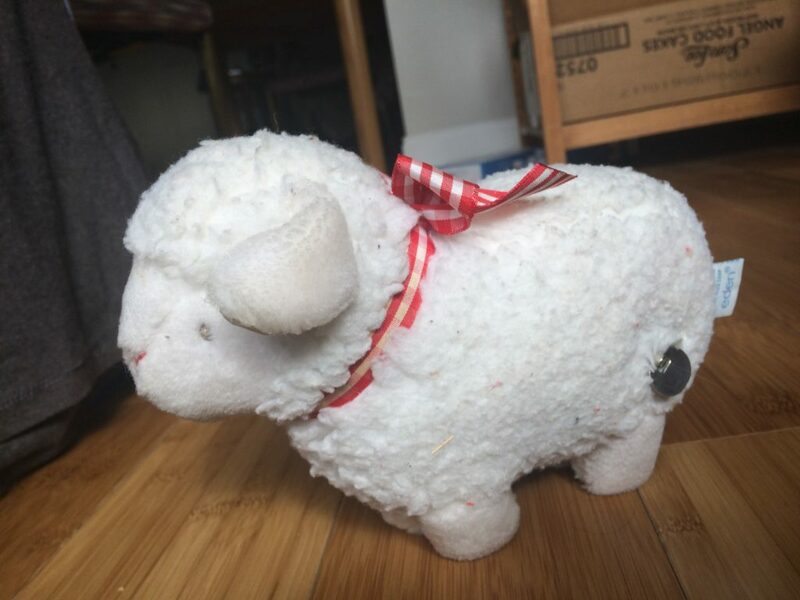 And I was struck by that story, by how this lamb that I remember nothing about–that just seems like a cute, fuzzy toy left over from my childhood–actually has all this history behind it, history that runs deep and long. Psalm 23, at least to me, is quite similar to this stuffed musical lamb. On a first reading, it can seem quite pretty and idyllic: God promises us food and water and comfort. That’s very nice! It conjures up images of perfectly-painted landscapes dotted with sheep, overlooked by one beautiful shepherd. He or she is wearing clothes that make me jealous and looking happily over their charges, who are all sleek and well-fed and enjoying life. I used to be able to say the psalm from memory; I memorized this psalm in middle school. It seems like everyone has done the same, at one time or another. I in some ways fell away from the psalm after that, for it seemed to be promising enough for all when it takes all of two seconds to see that that isn’t the case for everyone. It seems to be promising an easy life, one full of material abundance and ease. How do we hold on to this psalm that seems to promise something that clearly isn’t happening? It became something that I set aside–important, of course, but not something I used every day or even thought about all that much. But this psalm isn’t just happy sheep and feasts. (If you’ve known this for a long time, thanks for bearing with me) It’s not impossible promises. The psalm promises more than ease, more than an easy life. After all, the psalmist rejoices not only at feasts and safe water, but also that, “Even though I walk through the darkest valley, I fear no evil; for you are with me.” “God is with us”: this is the central promise of Christianity, just as this phrase is in the exact middle of the Hebrew psalm, for Jesus is also called Immanuel, or “God with us.” Jesus’ birth and presence on earth as a living, breathing human being is God’s commitment to being with us in everything, just as now we are given the Holy Spirit, who is with us in all times and all places; just as now we celebrate communion to remind us of that fact, rejoice and pray and do good, not to make it true, but to remind ourselves of truth. And just as God-with-us is the center of our faith–for it shows God’s love for us, eternal and forgiving and full of Christ’s mercy–it is also at the center of this psalm and its message. For the images of feasts and green pastures, safe water and anointing, do not promise the impossible. It is not a vision of unlikely earthly ease and comfort. Rather, it is a vision of God’s abundance. I don’t necessarily mean a physical abundance, shown in an always-full pantry and the long number attached to our checking account. I mean abundance as opposed to scarcity, where scarcity is that feeling of never-enough, of fear for what we have and the drive to protect what we have at all costs. Abundance, instead, is knowing that there is enough, for yourself and for others. It is knowing that God has blessed everyone, that God reaches out to everyone just as God reaches out to you, that there is no reason to be afraid. It is very, very hard to follow God from a mindset of scarcity, of protecting yourself and what you have. It is hard to hear God speaking, hard to follow. But in a mindset of abundance, we can hear God calling. We can know that there is enough, that we can and should give to others and ourselves, that God is there with us no matter what, no matter where we are or who we are. We can follow God, our shepherd, who leads us beside still waters and restores our souls, who is with us in the darkest of valleys and the most joyful of feasts. Our shepherd may not lead us to places of literal abundance, to places overflowing with milk and honey. But God’s abundance is more than literal. It is enough for wherever we are led, to our schools and jobs, to hospitals and funerals, to birthday parties and appointments and doctor’s offices. It is enough for us to love others as we love ourselves, to offer food and clothing, prayers and donations, time and presence to all those we are called to minister to. And so let us follow our shepherd, confident in the abundance of God’s grace, for ever and ever. Amen.